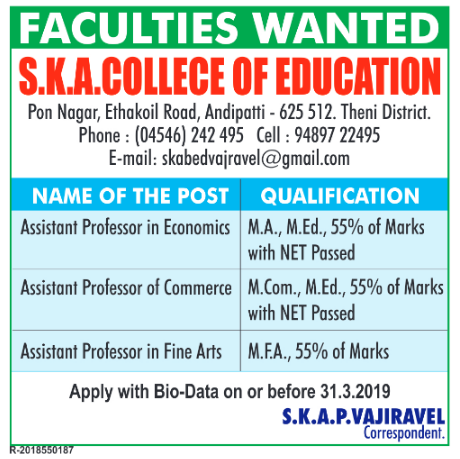 S.K.A.College of Education, Theni has advertised in the DINAMALAR newspaper for recruitment of Assistant Professors jobs vacancies. Interested and eligible job aspirants are requested to apply on or before 31st March 2019. Check out further more details below. About College: S.K.A. College of Education was started in the year 2015 in Andipatti by S.K.A. Educational Trust. Mr.S.K.A.P. Vajiravel is the Managing Trustee and the correspondent of our college. The trust was established in the year 1993. The objective of our trust is without any distinction of community, religion, caste and creed giving relief to poor or distrust persons, including the establishment, maintenance and support of institutions established for the purpose of relief to the people in poverty or distress. The major objective is to spend for the advancement and provocation of education learning in all subjects including the establishment , maintenance and support of schools, colleges and technical institutions. M.A / M.Com / M.Ed / MFA with 55% of marks and NET passed. How to Apply: Interested and eligible candidates are requested to send application along with CV, copies of certificates and PP size photos to the postal address given below.